And with that news, expect the most rapturous reception as the Norwegian coach - alongside his cohorts Mike Phelan, Michael Carrick, Kieran McKenna, and Mark Dempsey - leads out the Red Devils at Old Trafford this Saturday to face Watford. Solskjaer becomes the fourth permanent appointment since Sir Alex Ferguson’s retirement, following in the footsteps of David Moyes, Louis van Gaal, and Jose Mourinho. Let’s take a look at the five moments that have undoubtedly gone some way to seal the deal for the beloved Baby-Faced Assassin since his announcement as interim manager on December 19th. Retrospectively, it now looks like Solskjaer was tailor-made for the job, and those of the more cynical variety could do well to argue that he was auditioning from day one, upon his return to the club he made close to 400 appearances for and scored 125 goals. Solskjaer said at that time upon his unveiling in mid-December (MEN). “Obviously this is more of an honour, and I feel privileged to be helping the club for a few months. “When you are Manchester United there are a set of standards and demands that you have to be a team player. Here that sound? That’s a collective salivation from the worldwide Red Devils fanbase. United had had to look on in envy as their free-scoring neighbours Manchester United marauded in the post-Fergie era. 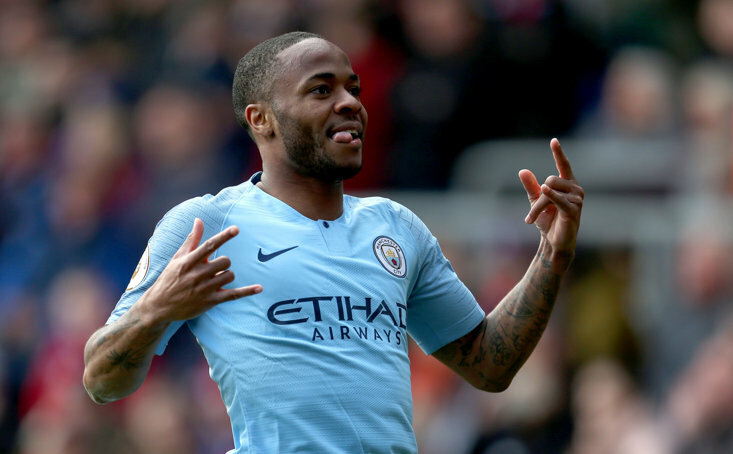 The Cityzens managed to score five or more goals past league opponents and astonishing 21 times since the last time the Red Devils had managed to do so, in Ferguson's last ever game at the helm, a 5-5 draw with West Bromwich Albion in 2013. 'Where was United's gluttony of goals?' was the collective clamour over the next five years. Well, Ole managed to achieve what Moysey, Louis, and Jose(y) (got Andy Tate in your head yet?) had failed to, in his very first game, with goals from Marcus Rashford, Ander Herrera, Anthony Martial, and a brace from Jesse Lingard at his old side of Cardiff City, and baptising his Man Utd managerial career in emphatic fashion. Solskjaer’s first real test was passed with flying colours. Scepticism had mounted from the perceived lack of real ‘credibility’ the opponents Solskjaer had seen off; relegation battlers Cardiff City and Huddersfield Town, and Bournemouth and Newcastle United, as well as Championship strugglers Reading at home in the FA Cup. ‘He’s only beaten <insert aforementioned team here>... So what?’ seemed to be the morose mantra ringing out from the naysayers. Then came Spurs, at Wembley, with a manager long said to be desired by the Manchester United hierarchy in Mauricio Pochettino. A goal from Wythenshawe-born Marcus Rashford for the visitors just before half-time marked the only difference in scoreline. A desperate Spurs side peppered the goal and admittedly dominated in the second half, but United stood firm, in no part due to the sublime David De Gea who received a whole avalanche of plaudits in the aftermath for his peerless goalkeeping ability, and epitomised how much this side were determined to play, and win, for Ole. Not only did it propel United back into top-four contention, decimate Spurs’ challenge for the title, but also marked Solskjaer’s sixth straight win of his tenure to record the best start of any manager in Manchester United's history. Sandwiched between an unenviable double whammy of visits from Paris Saint-Germain and Liverpool, United were handed yet another challenging draw in the FA Cup following on from another trip to the capital, where they faced and saw off Arsenal. The match at Stamford Bridge in the fifth-round saw a repeat of the 2018 Final, in which the Blues ran out winners thanks to an Eden Hazard penalty. This time around, a sterling Paul Pogba performance produces an exquisite, pitch-perfect cross for Ander Herrera’s opener, and the Frenchman himself pitched up powerfully with a header, leaving west London stunned. Credit also to De Gea’s deputy, Sergio Romero, proving why he’s probably the best back-up goalkeeper in England. 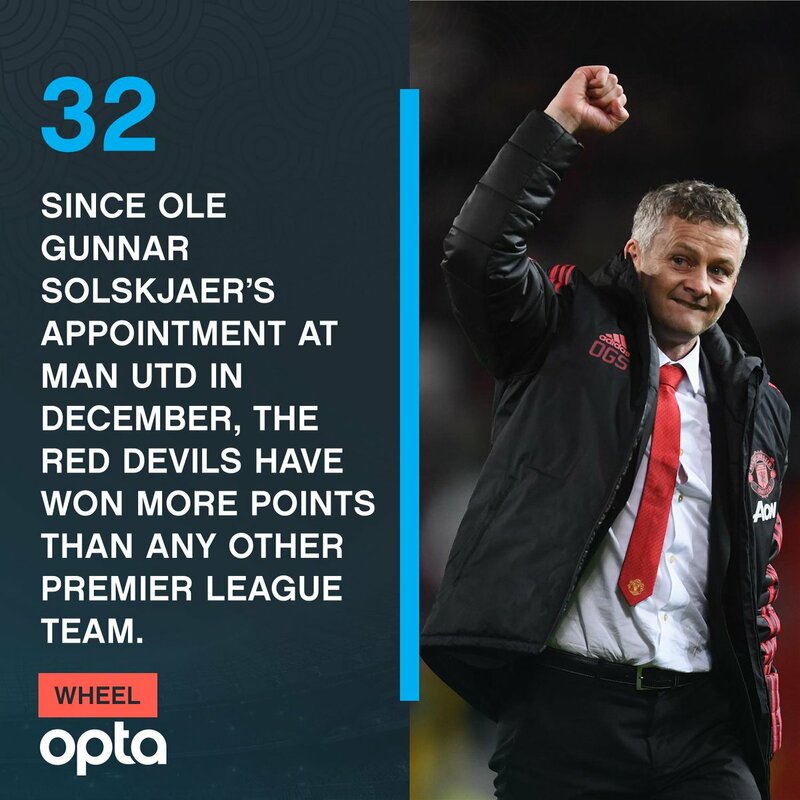 32 - Since Ole Gunnar Solskjaer's appointment at Man Utd in December, the Red Devils have won more points than any other Premier League team (32). Wheel. Notice the trend, all the matches to feature on the list have been away games. Oh what a night; since that evening at the Parc des Princes fans have been debating where this victory settles in the plethora of brilliant European nights Red Devils are privileged to reflect upon almost more than any other English side. 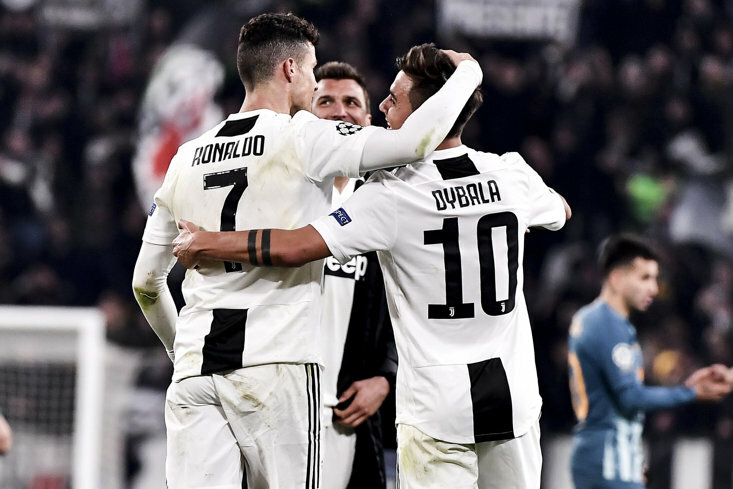 Better than Juventus or Bayern Munich ‘99? Or maybe that Roma result? Moscow? What makes this extra special is that the odds were so incredibly stacked in PSG’s favour, knowing that a 2-0 away result had never been overturned in Champions League history. The game that almost certainly removed all other names from that wish-list, as Solskjaer’s side produced exactly the result they needed, capped off with a balls-of-steel Rashford penalty to send United through to the Quarter-Finals of the competition. Kudos to the cameraman who had the foresight to immediately cut to that shocked face of one Angel Di Maria, the former Red Devil suffering the ire of the home fans upon his return to Old Trafford three weeks previous.